A woman visiting a post office in Novara, north-western Italy, has been stopped by police for wearing an Islamic veil covering her face. A police official told the AFP news agency the woman would have to pay a 500-euro (£430) fine. It is the first such police action since Novara brought in a by-law in January banning clothing preventing immediate identification in public. The city is run by the anti-immigration Northern League. The party is a powerful junior coalition partner in Prime Minister Silvio Berlusconi's national government. Novara Mayor Massimo Giordano said the by-law was meant to deter women from covering themselves with the veil in public. "But unfortunately it is apparently not yet clear to everyone that clothes preventing the wearer's identification can be tolerated at home but not in public places, in schools, on buses or in post offices," he said, according to the Italian state news agency Ansa. "There are still some people that refuse to understand that our community in Novara does not accept and does not want people going around wearing the burka." He said the by-law was "the only tool at our disposal to stop behaviour that makes the already difficult process of integration even harder". The woman, described as a Tunisian national, was apparently visiting the post office with her husband when she was stopped by police. When her husband refused to let her be identified by male officers, they called in a female colleague, AFP reported. Italy has, since 1975, had a national anti-terrorism law which forbids any mask or clothing that makes it impossible to identify the wearer. However, the law permits exceptions for "justified cause", which has often been interpreted by courts as including religious reasons for wearing a veil, Ansa reports. Several local authorities have introduced tighter regulations, and a Northern League bill currently before parliament would specifically outlaw Islamic face veils. Similar moves have been taking place in other Western European countries. A ban on wearing masks and veils in public has passed the Belgian lower house and is set to go before the Senate. It would be the first such national law in Europe if approved. The French government is pressing for similar legislation, and at the weekend a German member of the European Parliament said a ban should be enforced across the EU. The word hijab comes from the Arabic for veil and is used to describe the headscarves worn by Muslim women. These scarves come in myriad styles and colours. The type most commonly worn in the West is a square scarf that covers the head and neck but leaves the face clear. The niqab is a veil for the face that leaves the area around the eyes clear. However, it may be worn with a separate eye veil. It is worn with an accompanying headscarf. 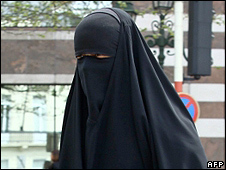 The burka is the most concealing of all Islamic veils. It covers the entire face and body, leaving just a mesh screen to see through. The al-amira is a two-piece veil. It consists of a close fitting cap, usually made from cotton or polyester, and an accompanying tube-like scarf. The shayla is a long, rectangular scarf popular in the Gulf region. It is wrapped around the head and tucked or pinned in place at the shoulders. The khimar is a long, cape-like veil that hangs down to just above the waist. It covers the hair, neck and shoulders completely, but leaves the face clear. The chador, worn by many Iranian women when outside the house, is a full-body cloak. It is often accompanied by a smaller headscarf underneath.